This is my favorite wine! So of course BevMo stopped carrying it last year. A few months ago, I was chatting with an internet friend who worked in the wine business. He said he also enjoyed Albariños, so I asked him if he could recommend a replacement. He suggested one from the Burgáns winery. I wasn’t able to find it anywhere until today! 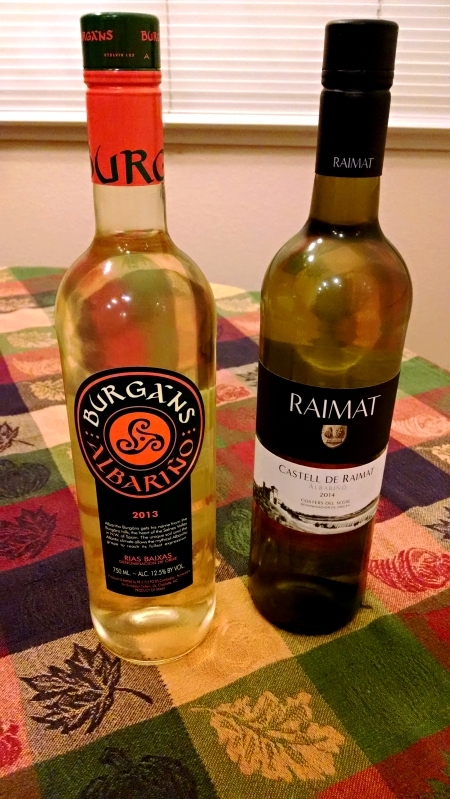 The Burgáns was in a special display, so then I went to check their regular wine section. I was able to find another bottle I hadn’t tried. At $12.99 and $10.99, it seemed like a reasonable investment to try and find a new favorite. I have tried a bunch of other Albariños since the Paco & Lola drought, but none of them have really caught my fancy. I’m hoping one of these will fit the bill.